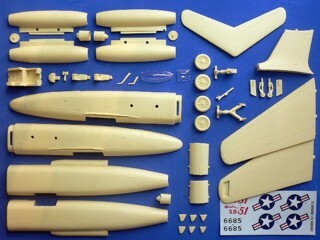 Each model kit contents one set of decal. Extra accessories of the canopy and decal can be side-order. In early 1946, USAAF issued requirement for a new attack bomber in succession to the Douglas A-26 Invader. Martin Company proposed its design and won the competition with designation, XA-45. Soon later USAAF revised its requirement for better close-support bombing. Martin accepted the new requirement and was received contract for two prototypes, the project was redesignated XB-51. The first XB-51 made its first flight on Oct 1949. It became the fastest ground support bomber at the time. In 1950, with Korean War outbreak, USAF called for a need of new night intruder bomber. The XB-51 was entered the contest in competition with English Electric Canberra. The XB-51 was faster but its endurance was poor than the Canberra. After a fly-off in 1951, the Canberra was chosen as the winner. Finally the XB-51 project was cancelled in 1952. Although Martin lost an order for XB-51 but received license to produce Canberra under designation B-57. The Convair XB-46 is suitable to group with the following collection series.